Why must we buy the high-level security hotel door lock? It is very important for the hotel operator or hotel owner to use the approved hotel door lock . Hotel door lock is one of the important material which has to be fulfilled by all of the hotel operators. In Avent Security, we supply the approved hotel door lock. So that you will be free from difficulties for running your hotel business. Electronic door locks for commercial properties work in different ways. Some of these electronic locks open automatically upon recognizing an RFID card. Or, much like with the biometric system, when it unlocks the door once proof of personal physical characteristic has been ascertained. Electronic door locks are a superior form of high-security locks that are a perfect match for a commercial building with a few or multiple employees coming and going throughout the day. Electronic door locks can also work from Radio Frequency Identification (RFID). These types of electronic door locks use a key fob or a card for the entry inside of a commercial property. In Avent Security, the RF card door lock used the RF card to unlock the door. 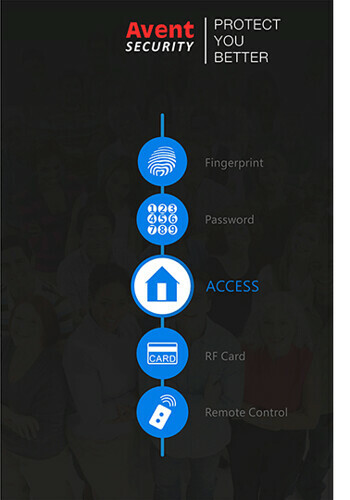 RF card can ensure the hotels better security for the rooms, and faster speed for unlocking. The RF card communicates by 13.56MHz high frequency. This type of card has a large data storage, which makes it can be used not only for a door lock but also for other entertainments in the hotel. The RF card door lock can match the access card to use. With the access card, you can collect the unlock records. Each access can collect 200 unlock the record. Match the PDA(handle device), you can collect more than 200 unlock records. After the collection, you can connect the PDA or the access card to the management software. Hotel owner needs to fulfill all the rules and regulations of the local authorities during your construction work. And all the job and material purchased must to have complied with the standard of requirements. Avent Security has a wide variety of products for your choices, such as the Avent Security RFID card door lock. RF card can ensure the hotels better security for the rooms, and faster speed for unlocking. This type of card has a large data storage, which makes it can be used not only for a door lock but also for other entertainments in the hotel. The RF card door lock can match the access card to use. With the access card, you can collect the unlock records. Each access can collect 200 unlock the record. Match the PDA(handle device), you can collect more than 200 unlock records. After the collection, you can connect the PDA or the access card to the management software. Through the management software, you can check the unlock records that you just collected. The manager not only can check the unlock records but also can make a copy for the unlock records, in case of the loss of users data. After reading this blog, do you want to know more knowledge about the Avent Security RFID card door lock? Follow us and we will introduce to you the difference between the fingerprint lock and RFID.